The E-AHPBA is the prime interdisciplinary organisation for HPB-surgical science and scholarship in our region and provides an international forum for presenting the state-of-the-art developments and science of HPB-surgery. This is achieved through conducting a biennial congress (alternating with the IHPBA World Congress), the location rotates around the region. Chapters who are considering bidding to host a future Congress should contact the Management Company for details of the bid guidelines. For more information on the next congress please visit here. In addition to the Congress the association holds a variety of annual meetings, courses, consensus conferences and workshops aimed to support all members at all levels of career development. The E-AHPBA also supports educational and scientific activities from its members and strategic partners where deemed appropriate. For more information please visit E-AHPBA Gold Seal Activities and E-AHPBA Endorsed Activities. Together with IHPBA, E-AHPBA also provides support and development within the outreach programme available to all low-income countries within our region. 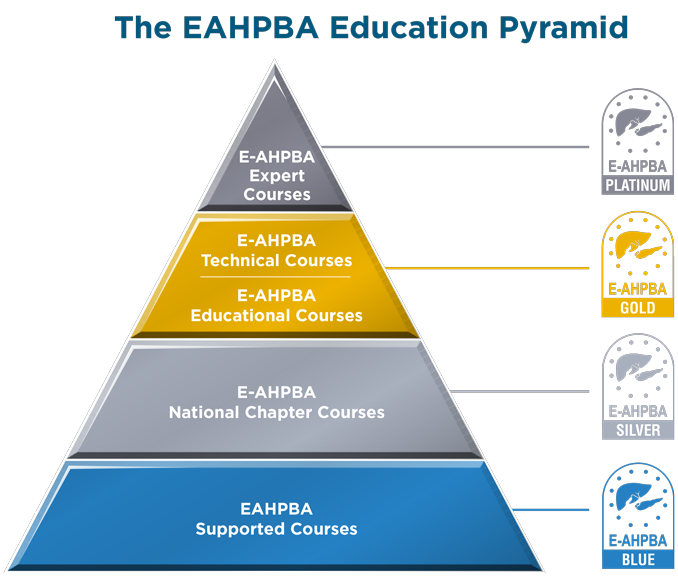 E-AHPBA has introduced the “educational pyramid” which categories courses and meetings that are available to all members. In addition, a Governance policy has been created, to read more about the structure and guidelines in place please click here. Organised and delivered by the E-AHPBA in partnership with a local organising committee. Members interested in hosting a course should apply to the E-AHPBA President by clicking on application link below. Organised and delivered by the E-AHPBA in partnership with the local organising committee. Members interested in hosting a course should apply to the E-AHPBA President by clicking on application link below. Organised and delivered by an official E-AHPBA National Chapter, preferably in conjunction with the Chapters annual meeting. Chapters organising a course that wish to be endorsed by E-AHPBA should apply to the E-AHPBA President by clicking on application link below. Organised and delivered by an E-AHPBA member. Members organising a course that wish to be endorsed by E-AHPBA should apply to the E-AHPBA Secretary General by clicking on application link below.